This classic Belafonte calypso is a must for your next steel drum band performance. 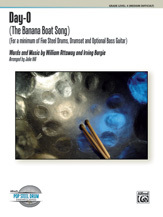 Treat your band and audience to the sound of the islands with the traditional "Banana Boat" song. This popular tune is arranged for lead, double tenor, double second, cello/guitar, bass pans, bass guitar (optional), and drumset.